Mhysa is an incredible dog that has lived a difficult life. When we met her she was a guard dog for a drug house, and her owner no longer had any use for her because he was selling the property. He planned to dispose of her either by cutting her free or worse so we stepped in to get her to safety. 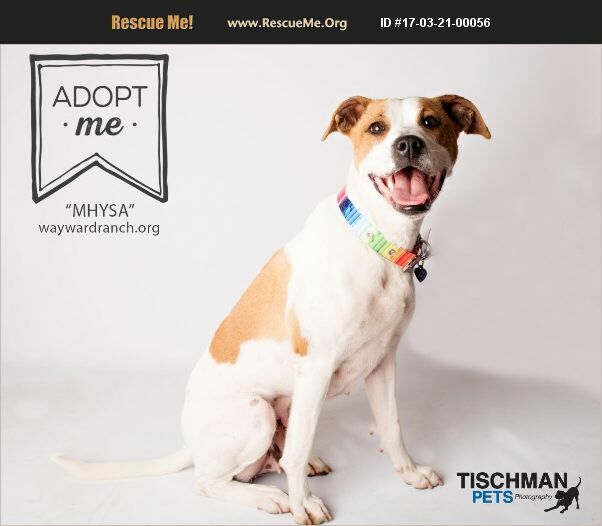 You can read more details about her rescue story here: https://www.waywardranch.org/mhysa-the-usd1000-dog When we got Mhysa what we expected was a dog that would be far too aggressive to be rehomed, because that is how her owner described her, but we were hesitantly hopeful that we could help her. We were shocked when after only one day with us Mhysa seemed like a dog that had absolutely no problems. She loved us, walked calmly past other dogs, and was incredibly smart! We were even more shocked to learn this sweet girl was very young, and is only about one year old! Mhysa is understandably nervous around new people due to her past, but she has gone through a great deal of training and is thriving. It now takes her just a few minutes to be comfortable with a new person, as long as they go slow with her. Once she bonds and opens up you'll be able to see how goofy this girl is! Her favorite things are belly rubs, squeaky bee toys, and meatball dog treats! She loves going for car rides and is completely housebroken. She walks well on leash and loves to go for walks. In public places like pet stores she is still nervous and can get shut down, but in the woods she is truly in her element and would make a fantastic hiking partner! Mhysa can't wait to have a home, for the first time in her life. Please give her a chance to wiggle into your heart! We ask that all families interested in her commit to meeting her several times, both to form a bond with her and to learn the training she knows to help her be the best dog she can be in her new home and life!